Losing your hair due to chemotherapy can take a toll on your self-image and outlook during treatment. If you're thinking about investing in a wig and have never worn a wig before, you're probably wondering there to begin. 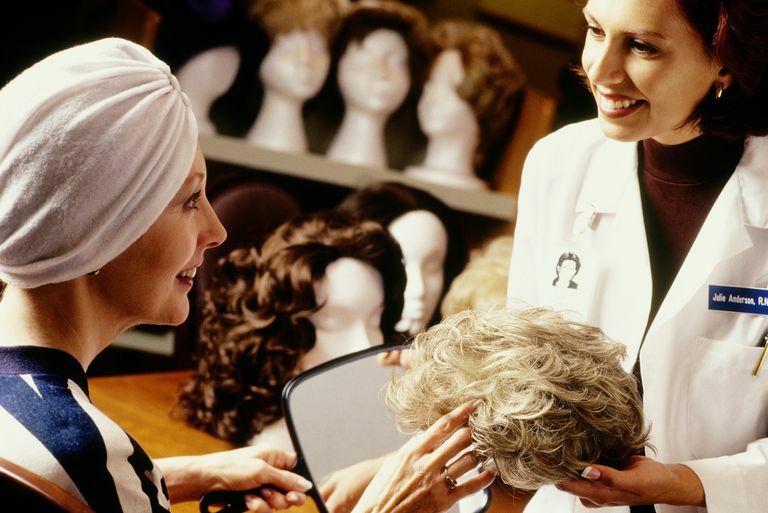 Before you visit a wig salon, trying them on and make a purchase, there are a few important things you should know. A comfort cap is a complete cap with no network that might cause scalp irritation or allow bald patches to be seen through the wig hair. Strands of hair are hand-tied to the base, making for a natural part in the hair. A cap-less or wefted base consists of an open network of woven material connected to a closed front section. Wefts of hair are added to the fabric network. A lace wig has 1 to 2 inches of fine lace fabric around the outer edge of the cap. Strands of hair are machine-tied or hand-tied to the base to create a very natural appearance. A monofilament base is a closed cap of fine mesh material with machine-tied or hand-tied strands. The upper front section of the cap is coated with a thin layer of latex, creating the appearance of a natural scalp. A wig made from synthetic hair has strands created from polymers, which can hold a style through wear and shampoo. There are many types of synthetic wig hair, and some can easily melt near heat sources. Some types of synthetic hair, such as Kanekalon, can be styled with heat tools. A real human hair wig can be colored, permed, cut, styled and blow-dried, just like your own hair. They must be restyled after each shampoo. A full wig covers the entire hairline just as natural hair does. If you've lost all of your hair during chemotherapy, then a full wig is for you. A partial wig is woven into hair. If chemotherapy makes your hair thin and you just want to add a little more fullness, this is a great option. A wiglet can be added to your hair with clips or combs to easily conceal bald spots and add length to short hair. A hairpiece is the perfect solution if you don't want a full or partial wig. If you want a little fringe to tuck under a scarf or a summer hat, try a hairpiece. There are bangs, halo wigs, headband hair, ponytails and braids. With so many styles to choose from, you could change your look several times a week! There are lots of organizations that can help you get a free wig to use during cancer treatment, but you might consider buying one. Check with your health insurance provider to see if they help with the cost of a cranial prosthesis: the medical term for a wig. Human hair wigs are the most expensive. High quality human hair wigs from Europe top the price list, with hair from India and Asia a close second. Some real hair wigs are a mix of human and animal hair, which cuts the cost a little. Synthetic hair wigs generally sell for lower prices than real hair, but a high-quality synthetic wig can cost just as much as a medium quality human hair wig. Wig hair is graded by strength, elasticity and porosity. The better the hair quality, the greater your cost, and with care, the longer you will be able to wear the wig. Consider how long you might need to wear a wig before you decide what you want to spend on it. Wigs and hairpieces, like your natural hair, require care and attention to look good. Plan on shampooing, conditioning and drying your wig. Use the right products for wig maintenance. Stock up on wig shampoo, wig conditioner and wig spray. Never use heat tools on a synthetic wig, unless it is made of special heat-resistant polymers. Synthetic hair can melt or frizz and must be repaired if it's damaged. Invest in a folding wig stand if you plan on traveling with a wig. You should use a wig brush, not a hairbrush, on a wig. Brush it out gently to avoid pulling out hairs. If you use barrettes or clips on a wig, remove them overnight so crimps don't permanently bend the hair. The better you take care of your wig, the longer it will keep you looking good!